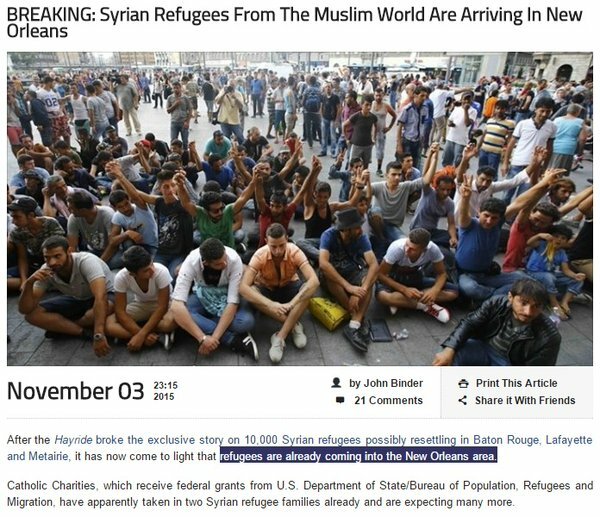 As the dead are still being counted in Paris, with at least one of the Muslim terrorists identified as arriving in Europe a ‘Syrian refugee,’ the first transport of Syrian Muslim ‘refugees’ have arrived in New Orleans and will be resettled in Louisiana and 180 other American communities. Is your city among the “lucky” ones? See the list at the bottom. 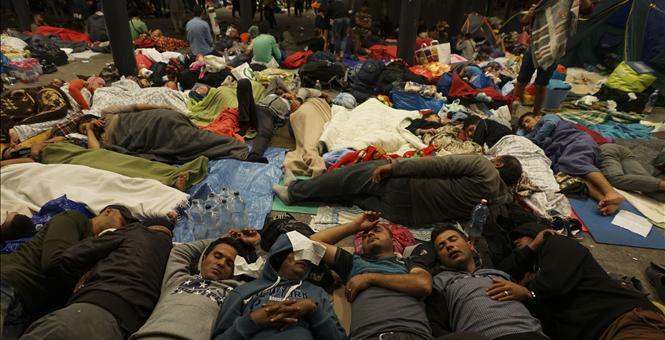 Top Right News The 10,000 Syrian refugees are first flown to the United States, according to the French news wire Agence France-Presse, with the State Department paying the International Organization for Migration (IOM) for the airfare. After approximately 90 days, refugees are no longer eligible for the State Department-funded support that they were receiving through migrant and refugee services so they will be put on the State welfare rolls. 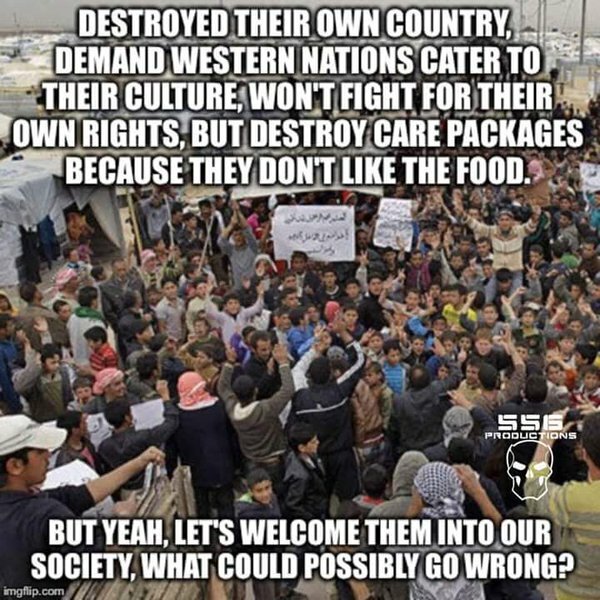 Additionally, it is unclear how much the screening process for the 10,000 Syrian refugees will cost American taxpayers. Fox8Live […] We turned to former New Orleans FBI chief and anti-terrorism expert Jim Bernazzani for insight on whether that’s a legitimate concern. Before coming to New Orleans, Bernazzani worked to ramp up the nation’s anti-terror strategies after 911. “If I was in charge of ISIS, logistically I’d take advantage of this situation and put my jihadist fighters in, into the United States,” Bernazzani said. In fact, our own DHS Secretary Jeh Johnson actually said “we don’t know a whole lot” about Syrian refugees coming into America, and that DHS has “no active protocol” for proerly screening them. 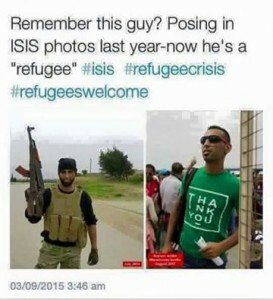 And as Top Right News reported in September, Syrian ISIS operative claimed that more than 4,000 covert ISIS gunmen have already been smuggled into Western nations – “hidden among innocent refugees”. 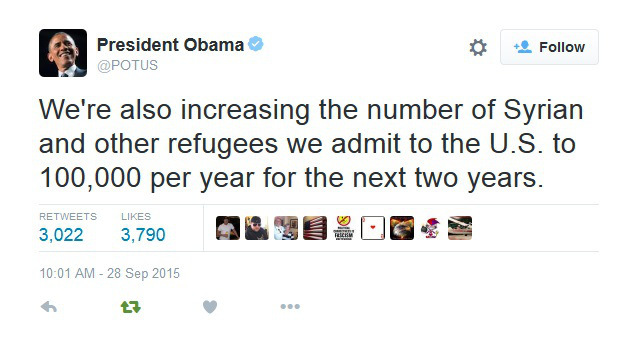 And according to Secretary of State John Kerry, the Obama Administration plans on bringing in a staggering 200,000 so-called “refugees” in 2016..meaning these 10,000 in Louisiana are just a down-payment on future terror attacks in New York, L.A, Washington, and God know where else. What if there really is a specific plan to transform America into an Islamic nation by 2020? 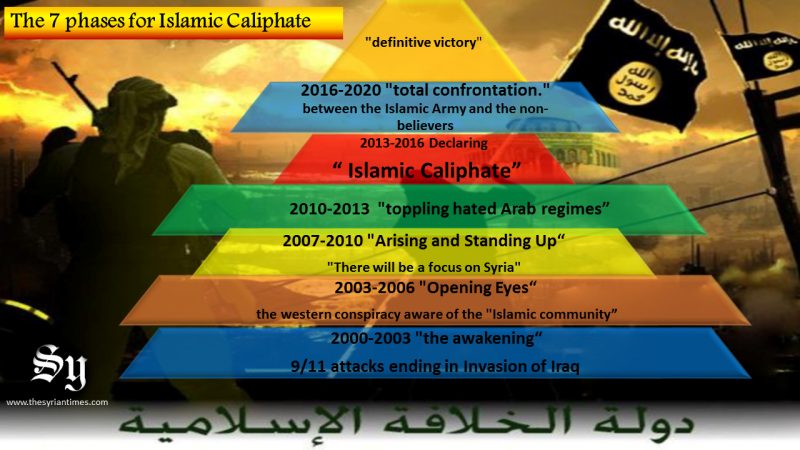 An awakening began on September 11th, 2001 and it was the first of al-Qaeda’s 7-phase plan. That’s one of the intertwined foundations of the Christian suspense novel, Invasion 2020. The novel includes facts about the true nature of Islam and their agenda concealed by a compliant media and an ignorant administration. With references to many true stories and articles about Islam, the reader can see how much has been hidden from their view. The suspenseful story takes the reader on a journey with terrorist attacks, political intrigue, plus a web of media and government deception. There are also spiritual transformations, changed lives, and even a little romance. You’ll want to follow the compelling character’s ups and downs, their conflicts and challenges coupled with their battle to inform the public about the dangers and reality of Islam. The author doesn’t just weave a good tale about good and evil, but enlightens, entertains and educates. 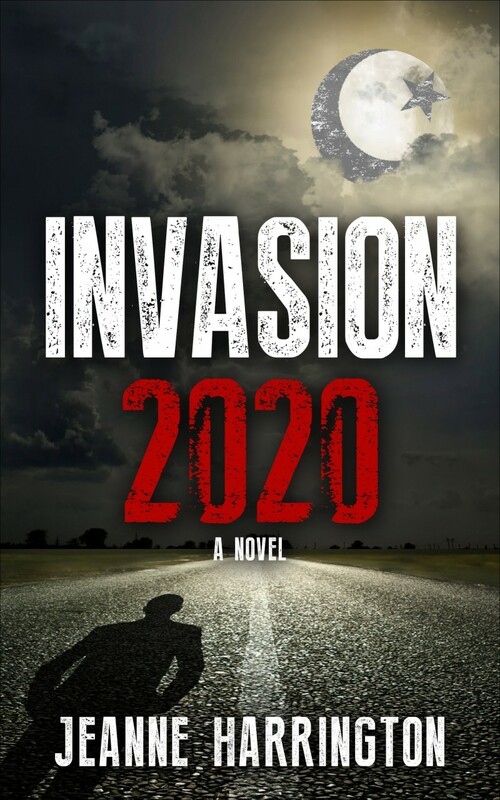 Get the eye-opening ebook version of Invasion 2020 now and watch for the print version to be released in 2016! Experts Speechless Upon Most Unexpected Discovery! Evidence the USA Is About To Be Ushered Into Endless Tailspin of Apocalyptic Events? It Certainly Appears That Way! 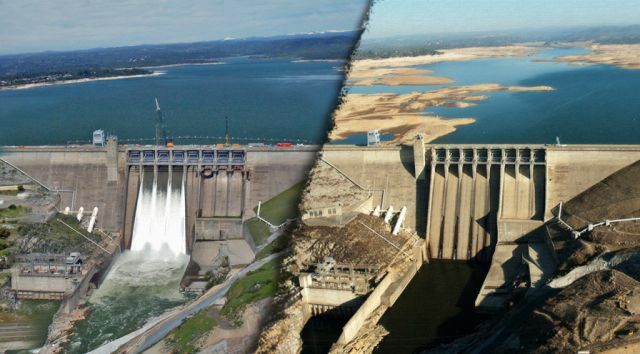 Lyn Leahz|December 11, 2014 Many people have no real clue just how important California is to us in relation to produce, nuts, and a whole slew of circumstances which could lead us into a nasty tailspin of apocalyptic events should the current three year drought continue without much of a reprieve. And, according to experts, worse is coming! However, that’s not all they have discovered—there is more—and they are genuinely surprised by their recent find. But first, we must ask, what would it be like if California were to disappear? Experts Speechless At Unexpected Find! Proof USA To Soon Be Ushered Into Tailspin of Ominous Events? It would be one massive, nasty domino effect after another which would have dire results on the entire United States of America. Clearly, this would fulfill Revelation 6:6. Re-read the second paragraph above and then read Revelation 6:6 (below). Grain prices would escalate drastically, the young and poor would be affected on a large scale, yet the rich (the oil and the wine) would not be touched. VISALIA, CA – FEBRUARY 5: Land is exposed by the extremely low water level of Lake Kaweah on February 5, 2014 near Visalia, California. Now in its third straight year of unprecedented drought, California is experiencing its driest year on record, dating back 119 years and possible the worst in the past 500 years (Lyn Leahz: as you will see below, new information has revealed that this figure has changed drastically). Grasslands that support cattle have dried up, forcing ranchers to feed them expensive supplemental hay to keep them from starving or to sell at least some of their herds, and farmers are struggling with diminishing crop water and what to plant or whether to tear out permanent crops which use water year-round such, as almond trees. About 17 rural communities could run out of drinking water within several weeks and politicians are are pushing to undo laws that protect several endangered species. More than 80% of California is now in a state of extreme drought, according to the latest assessment. The environmental conditions that residents are experiencing today actually began in 2011. Still, there seems to be no end in sight. Water costs are sky high, as you would expect, but Californians are paying the price in more ways than one. The state’s Central Valley agriculture industry, for example, stands to lose $1.7 billion this year as a result of what some believe is the worst drought to affect the region in 500 years. (Note, Lyn Leahz: This number has greatly increasd to date. See more below.) Some 14,500 workers could lose their jobs in an area responsible for half of the state’s agriculture and five percent of the entire nation’s. Jesus Christ told the disciples in the Bible (Matthew 24:7—below) that famine (which is a result of drought) would be one of the signs that we are living in the time of the birth pains, which puts us very close to the beginning of the tribulation, when that happens. California’s three year drought is the worst seen for over 1200 years, researchers have found. Scientists looking at the cumulative effects of temperature, low precipitation and other factors said that it all adds up to the worst conditions in more than a millennium. They also claim that worse could be to come, with droughts almost certain to occur again in the future. A combination of record high temperatures and sparse rainfall during California’s three-year drought have produced the worst conditions in 1,200 years, according to a study accepted for publication by the American Geophysical Union (AGU). 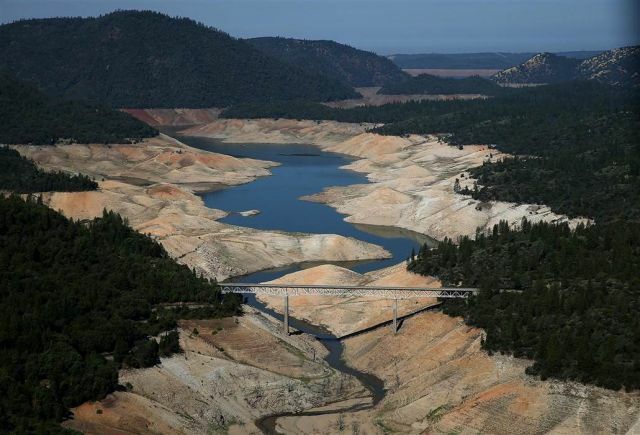 ’The current California drought is exceptionally severe in the context of at least the last millennium and is driven by reduced though not unprecedented precipitation and record high temperatures,’ the report’s authors said in the study released late Thursday. The study by the University of Minnesota and the Woods Hole Oceanographic Institution said that warm, dry conditions have shrunk the supply of surface water from reservoirs, streams and the Sierra Nevada snowpack in the state, even as demand from people and farms has gone up, resulting in unprecedented scarcity. Daniel Griffin, an assistant professor in the Department of Geography, Environment and Society at the University of Minnesota, and Kevin Anchukaitis, an assistant scientist at Woods Hole Oceanographic Institution, asked the question, ‘How unusual is the ongoing California drought?’ and collected new tree-ring samples from blue oak trees in southern and central California. Blue Oak trees are very sensitive to moisture changes and their tree rings vividly display moisture changes and fluctuations. Griffin, a NOAA Climate and Globaly Change Fellow and Former WHOI postdoctoral shcholar stated, ‘We were genuinely surprised at the result. This is California – drought happens. Time and again, the most common result in tree-ring studies is that drought episodes in the past were more extreme than those of more recent eras. The result was different? This means that in times past it was not worse or even equal to the magnitude it is now. In other words, to as far back as they are able to date using the tree ring method, what is happening now exceeds any of the droughts that have occurred before. 2015: Something Terrifying, Sinister and Beyond Cryptic Has ‘JUST’ Been Announced-We Are In SERIOUS Trouble! Thought Things Were Bad? It Is About To Get Much Worse! WELCOME TO THE RISE OF THE GLOBALIST, ANTICHRIST NEW WORLD ORDER! IT IS NO SECRET—WE HAVE SO MANY PLEASANT SURPRISES IN STORE FOR YOU! ALL THAT IS REQUIRED OF YOU IS TO SIT BACK, DO NOTHING AT ALL, AND WATCH. YOU ARE THE PUPPETS, WE ARE THE MASTERS—WE PULL YOUR STRINGS AND LAUGH AS YOU PLAY ALONG! But what does ‘The Economist‘ have to say about this issue? 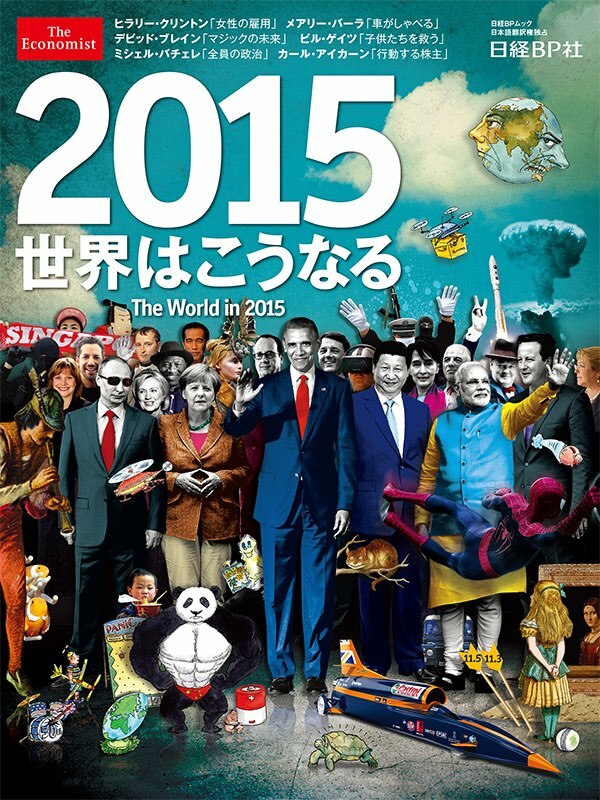 The World in 2015, the latest in The Economist’s annual collection of predictions, identifies and explores the issues that will shape the year ahead. Prominent figures from politics, business, science and the arts join journalists from The Economist and other leading publications in offering forecasts for 2015. Politicians such as Joko Widodo and Matteo Renzi outline their plans for reforms, Hillary Clinton focusses on closing the gender gap and David Blaine reassures us that magic can still amaze. For much of 2015, the world’s divisions will draw the most attention. While some economies are moving ahead, others are in danger of slipping back into recession. Nationalism is on the rise even as the West argues over how to respond to a rogue Russia and rampant jihadists. But it’s not all gloom: sporting and speed records could be broken, cinema-goers will delight in a new Bond movie and a new Star Wars sequel, and NASA’s New Horizons spacecraft will give us a fleeting glimpse of Pluto. 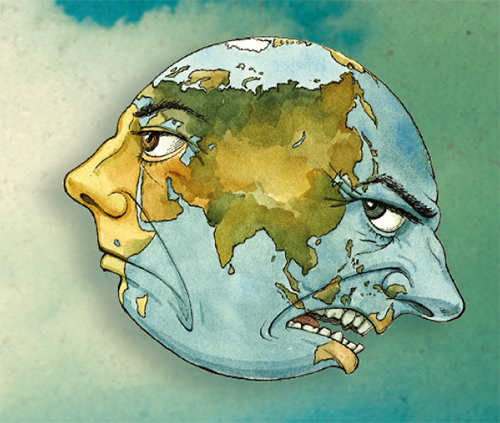 Notice that one side of the globe-face cartoon gazes stoically towards the West while the other side appears quite angry. Is this a representation of a confrontation between the East and the West? The cover also features a slew of other symbols referring to the “rise of the East”. 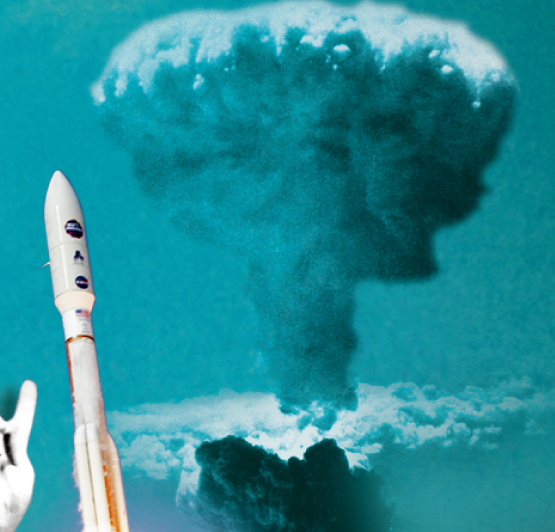 What is even more disturbing is that directly beneath the angry globe cartoon are pictured a mushroom cloud (the type that occurs when a nuclear bomb explodes) and a spy satellite launching into space. Symbols of high tech surveillance and nuclear war? 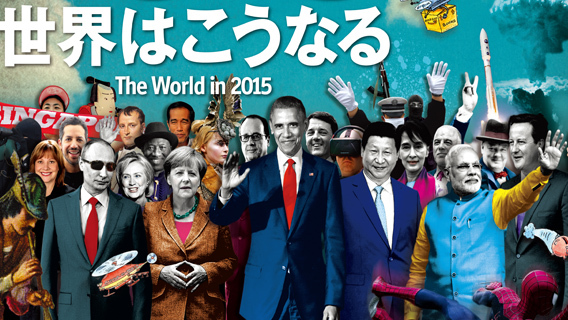 The Economist does not appear very optimistic about 2015, to say the least. What is going on? Well, nearly 60% of United States citizens believe that something BIG and something BAD is going to happen this year. Just wait until you see what some of these cryptic, chilling symbols on the Economist cover mean—it is downright wicked! Just a quick mention, and then back to the Economist—if you’ve seen a few of my recent posts, I clearly revealed to you the danger we are in ‘in’ relation to the coming earthquakes—the New Madrid, the San Andreas Fault, and the Cascadia Subduction Zone. So much that even mainstream is now sending out the warning for people to prepare! These quakes will rip the United States of America in half! And, there is no question about “IF” it will happen, but “WHEN”. For more on that topic, watch the below videos. Experts VERY CONCERNED-Warning USA To Prepare! Horrific Monster Quakes To Shake the Hell Out of USA! Alarming New Information-USA About To Shake and Bake-Experts Warning To Prepare! Getting back to the creepy, disturbing imagery on the Illuminati-owned Economist cover, you will note that in the lower left, the Pied Piper of Hamelin is seen with a child directly below him. The presence of the Pied Piper on this 2015-themed cover is downright unsettling. 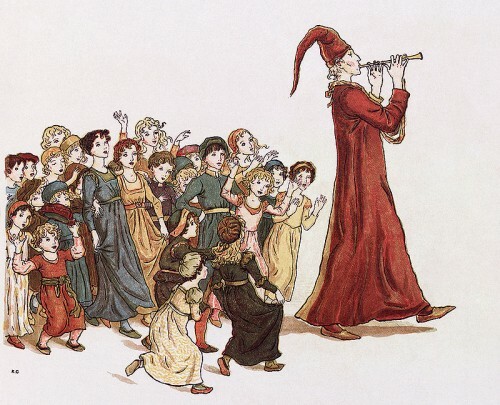 The Pied Piper of Hamelin is a German legend about a man who used his magical flute to lure away the children of the city of Hamelin, never to be seen again. This folkloric figure dating from the Middle-Ages is said to represent either massive death by plague or catastrophe, or a movement of massive immigration. It also perfectly represents today’s youth being “lured” and mystified by the “music” of mass media. Conveniently enough, there’s a small boy right under the Piper’s flute. Please, check out the Feature Video (the first video at the beginning of this post, above) for a detailed description of some of these picture messages and what they could very well mean for us this year! There is so much to discuss here, I am ony brushing on a few things—but it is ALL in the ‘Feature’ video. Also, you will note some ‘strange’ numbers in the lower right corner of the Economist cover near Alice from Alice In Wonderland, printed on the end of two bows. Please refer HERE and HERE. This is mentioned in full detail within the above FEATURE VIDEO. We have prepared…NOW, we strike! Remember this chilling commercial? Regarding the turtle symbol and the Fabian Society’s motto—check out this commercial for Maserati and how they mention “striking hard”. Could the giants they are referring to be the West? Or, even more disturbing, the serpent seed, which is the nephilim-fallen angel-illuminati bloodline? Also, at approximately 30 seconds, notice the birds form the all-seeing eye, and directly beneath, the top of the tower is shaped like a pyramid! And, at 15 seconds, three God’s Eyes, or Eye’s of God, (one of them is to the far left in the shadows…probably symbolic of secrecy, knowledge only they possess; shadow government) And, to the left of the largest one on the right appears to be an upside down compass, the Freemason symbol. And, finally, at approximately 50 seconds, the message is absolutely disturbing! If the previous information isn’t enough to make you scratch your head, it gets even worse. According to a recent post on the Dave Hodges Show Website (link included below at end of quote), our water supply is in serious danger! However, there is now some evidence that our utilities will be the target which could come under attack, specifically, an attack against our water treatment facilities. I do not like releasing information from confidential sources which is totally unsupported by other data. The intelligence information is coming from three media personnel representing five confidential sources by my count and all of the sources are unnamed. For the past three weeks, I have been following leads which could support the notion. If water treatment was unable to filter waste particles from our drinking water, that community would quickly experience an outbreak of the deadly cholera which is one of the major causes of death in the third world in which water treatment is very crude. According to a couple of prepper experts that I spoke with, it would take 3-5 days for the worst to begin to happen following the compromising of water treatment. Clearly, civil unrest would go viral as people would begin to search for drinking supplies after their personal drinking supplies became exhausted. Variables such as the time of year would come into play and have a significant role in the severity of the crisis. Could you imagine if this were to happen in Phoenix, where I live, in the summer? Still not enough? Check out this video to see what the Luciferian’s that govern this world are planning to do VERY SOON! It is sickening and very disturbing, and in plain sight! Bone-Chilling! Dark Secrets In Plain Sight-Satan’s Bloodline Working In the Shadows, and It’s Evil! Folks, these are only highlights from the included video. There is much, much more. It is going to get real ugly this year, 2015. Not only is the world saying it, but the true body of Christ is saying it..and even the enemy, Satan himself is boasting of all that he will do. Are you prepared for this? Or are you merely shrugging your shoulders, not paying hardly any attention at all? I put myself out here quite often in attempt to warn you. I am beat up, but not destroyed. I am cursed, mocked, scorned, insulted but I refuse to stop blowing the trumpet! There is more! Another dead banker? Have you seen this? Senator Dianne Feinstein has gone on record saying she believes there are terrorist sleeper cells present in the US laying in wait to carry out an attack similar to the deadly incidents that rocked Paris last week. The California Democrat and former Senate Intelligence Committee chairwoman made the ominous comments while appearing on CNN’s State of the Union Sunday to talk about the waiver program, which allows foreign nationals from 38 countries to enter the US for up to 90 days without a visa.